Why perform a Cell Identification Check? – Bio-Synthesis, Inc.
Home › Bioanalysis › Why perform a Cell Identification Check? What is a Cell ID Check? 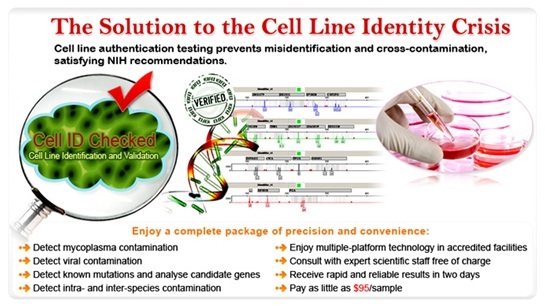 Cell ID Check is a comprehensive human cell line authentication service. This service combines inter-species testing using a combination of species specific PCR primers and intra-species testing using PCR based profiling methods. Test for inter-species contamination is performed by multiplex PCR. DNA from the species of cell lines most commonly used in biomedical research is identified. Bio-Synthesis (BSI) offers speedy and reliable genotyping service for human cell line authentication and mycoplasm detection services performed by our team of experts with years of experience in SNP, STR DNA profiling, marker exhaustion, high-resolution Luminex HLA DNA genotyping, DNA sequencing and bioinformatics data analysis. Our services are performed at accredited human DNA identity testing facilities. Our commitment to total quality management (TQM) assures that our customers receive only the most highly discriminating methods of species and identity confirmation and detection of cell cross-contamination and cell misidentification, bringing their research into compliance with NIH recommendations and scholarly journal guidelines. Our standard cell line genotyping PCR testing allows detection of contaminations and mutations between human cell lines. Furthermore it can also verify whether the cell line in question originates from a human by detecting the absence of standard markers. Our species-specifics authentication services can selectively verify whether the cell line in question is indeed one of the 14 detectable species using our two-pronged inter-species identification and detection approach. Intra-species identification services is currently only available for human cell lines. Cell line authentication can verify whether the genotype of the cell line in question is identical to the genotype of the presumed parental cells. If the parental cells genotypes have been determined by a recognized repository (ATCC, DSMZ, or JCRB), the genotype of the submitted cells can be compared to genotypes in the database. Bio-Synthesis is also able to genotype any parental cells not already represented in the database. This type of testing is performed by short tandem repeat analysis (STR) which allows to verify that the genetic profile of the sample matches the known profile of the cell line. STRs are repeating segments of DNA that are 2 to 6 base pairs in length that have a diverse number of repeats at a single locus. STRs are sometimes also called microsatellites or sequence repeats. The diversity of alleles at a single locus makes it possible to generate unique genetic profiles by combining analysis results for a number of marker loci. To determine gender the amelogenin marker found on the X and Y chromosome is used. To generate the STR genetic profile first DNA is extracted from an cotton swab of check cells or any other DNA collection device followed by quantifying the DNA in the extract. Next, PCR is performed on the sample followed by analysis using a capillary electrophoresis analyzer such as the Applied Biosystems PRISM 310, 3100/3100 Avant, 3130/3130xi, and/or the 3500xL Genetic Analyzer. This type of analysis allows detection of the various fluorescently labeled products and accurate determination of product size enabling differentiation of the STR alleles at each locus. Below is a table of the STR loci amplified by the AmpFlSTR® Identifiler Plus kit. Table 1 contains marker loci for generating genetic profiles that can be used for the determination of intra-species contamination. The National Institutes of Health and increasing numbers of scholarly journals have defined guidelines for the authentication of any cell lines to be used in grant-eligible projects or in papers submitted for publication. Authenticate every time a new line is established or acquired. Cells should be authenticated again before freezing, once every two months that the culture is actively growing, at any point that the performance of the line is inconsistent or yields unexpected results, and before publication. Test cells whenever more than one cell line is in active use in the same laboratory to rule out cross-contamination. Test cells when beginning any new series of experiments. STR based genetic profiling can be used as a quality control procedure for any research materials based on human cells or tissue resulting in a bar code for the research material. The establishment of the initial profile will allow to compare and to verify the correct material by comparing the profile from the retested material with the original. STR profiling is a useful tool to create bar codes for cell lines in tumor banks, primary cell culture isolation and any other research study that involved the use of human cellular material.